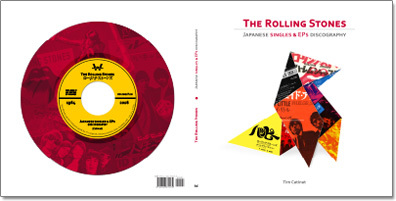 The exclusive book The Rolling Stones Japanese singles & EPs discography is now available here. More details on this book here. All items are in near mint (nm) condition (highest grade), unless stated. When 2 grades appear, cover is graded first, then record. Nanook uses a conservative European grading : ss - nm - ex - vg - g, with (+) or (-) indicating slightly better or worse for each grade below nm. 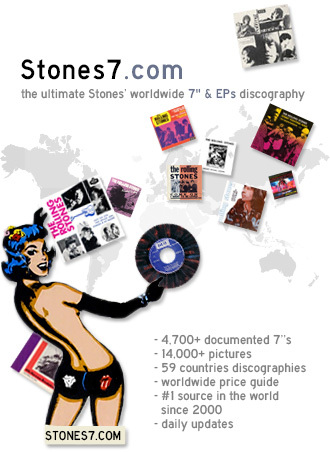 Note that this catalogue is also available through other major sites where prices are higher due to third parties fees. Listen! 7" & mag - EMI VINYL LYN 13214 - promo-only ultra-rare clear 1-sided flexi disc given free w/ 'Vinyl' magazine (issue #11 from June 1983) - Mick Jagger speaks in French to promote the movie 'Let's Spend The Night Together' over a Rolling Stones medley - unique to France and official!